Follow these steps to select the perfect window treatment. First, think of the room and how you use it day in and day out. For example, in your bedroom you may like total darkness, but in your family room you may not want to obstruct your view. Second, define the main role of your window? Do you like to have it open to allow the breeze to come in or do you just want to block the sun during peak times? Third, what type of privacy do you need in each room? If your bedroom faces the street you may want total privacy, but in the family room you may want to have some privacy but still allow light to come in. Fourth, are you a tilter or a lifter? If you like to control the amount of light coming into a room by tilting the direction of your blinds, then you’re a tilter. Lifters prefer to control light and privacy by lowering or opening a larger window covering. Lifters love our top-down/bottom up shades! Five, what is your décor style? Do you like casual and cozy, contemporary and sleek, traditional and elegant? 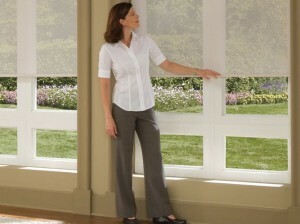 We have the window treatments that suit your specific design preferences. Visit our window treatment store in West Bloomfield, and we’ll walk you through these five steps to help you select the perfect window treatment. 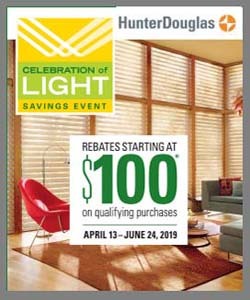 We also offer risk-free purchasing through our Hunter Douglas Right Choice Promise™ program. Make your choice with confidence: Just try out your new window treatment and exchange them if you are not completely satisfied. Exclusively offered by Hunter Douglas Gallery® stores like ours, the Right Choice Promise gives you additional peace of mind when making your window treatment selections. Here is how it works: Once the installation of your new Hunter Douglas window coverings is complete, we invite you to experience and enjoy them in your home for 21 days. In the unlikely event you’re not thoroughly satisfied with the way they visually enhance your home at the end of this 21-day period, contact us and we’ll make it right. Visit our showroom in West Bloomfield MI to learn more about the Right Choice Promise program and see our many displays of window shades. 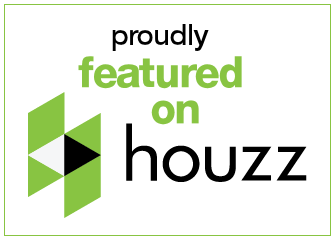 We’ve been serving the areas of West Bloomfield, Northville, Bloomfield Hills, Birmingham, Franklin, Bloomfield Hills Township, Novi, Farmington Hills, Oakland County since 1977. We look forward to serving you!